Home » » Effect Of Media Trial And The Court | Olatunji M. Dawodu Esq. 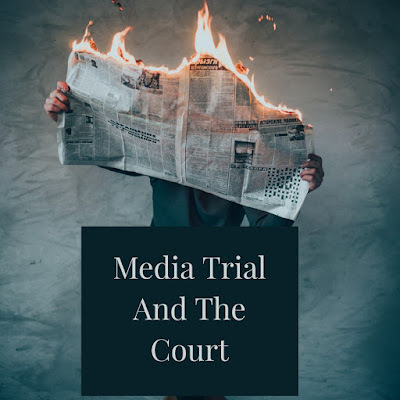 Effect Of Media Trial And The Court | Olatunji M. Dawodu Esq. Freedom of media is the freedom of people as they should be informed of public matters. It is thus needless to emphasis that a free and a healthy press is indispensable to the functioning of democracy. In a democratic set up there has to be active participation of people in all affairs of their community and the state. It is their right to be kept informed about the current political social, economic and cultural life as well as the burning topics and important issues of the day in order to enable them to consider forming broad opinion in which they are being managed, tackled and administered by the government and their functionaries. To achieve this objective people need a clear and truthful account of events, so that they may form their own opinion and offer their own comments and viewpoints on such matters and issues and select their future course of action. The right to freedom of speech and expression is contained in the 1999 constitution. However the freedom is not absolute. However the right to freedom of speech and expression does not embrace the freedom to commit contempt of court. The trial by media is definitely an undue interference in the process of justice delivery. Before delving into the issue of justifiability of media trial it would be pertinent to first try to define what actually the ‘trial by media’ means. Trial is a word which is associated with the process of justice. It is the essential component on any judicial system that the accused should receive a fair trial. It completely overlooks the vital gap between an accused and a convict keeping at stake the golden principles of ‘presumption of innocence until proven guilty’ and ‘guilt beyond reasonable doubt’. Now, what we observe is media trial where the media itself does a separate investigation, builds a public opinion against the accused even before the court takes cognizance of the case. By this way, it prejudices the public and sometimes even judges and as a result the accused, that should be assumed innocent, is presumed as a criminal leaving all his rights and liberty unrepressed. If excessive publicity in the media about a suspect or an accused before trial prejudices a fair trial or results in characterizing him as a person who had indeed committed the crime, it amounts to undue interference with the “administration of justice", calling for proceedings for contempt of court against the media. Unfortunately, rules designed to regulate journalistic conduct are inadequate to prevent the encroachment of civil rights. Trial By Media Is Contempt Of Court And Needs To Be Punished. If anybody has a case to answer, charge him/her to court. No lawyer is afraid of going to court especially when he or she has done no wrong. But going into the media deliberately to paint someone black by maligning and casting aspersions on the person's integrity is so preposterous especially when it comes from a lawyer.